There’s much to celebrate today. It’s the Chinese Lunar New Year. In the U.S. we have Super Bowl mania. While grocery shopping yesterday, you’d think we were stocking up for a famine. Customers bought snacks by the truckload, treats for humans and pets (we’re down with the treats part) for eating, drinking and watching the Super Bowl. 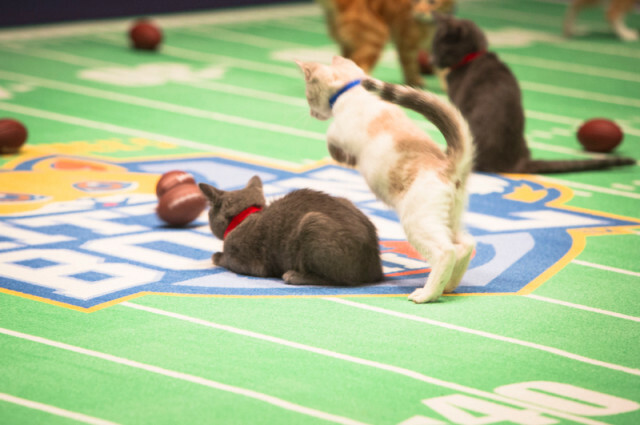 Football is not a big deal at our house but we make exceptions for the Kitten Bowl. And thrilled all 100 kittens appearing today were adopted! January 1 may be our calendar new year but it’s never really feels like a fresh start until the lunar New Year which begins today. After an entire week of cleaning and preparing everything we feel ready for a burst of creative good fortune. The Lunar New Year is celebrated by all Asians, but is morphing into an All-American holiday regardless of race or heritage. Part of the reason is the growing interest in feng shui. When I began studying the ancient art of placement twenty years ago, it folded effortlessly in my lifestyle but few understood what I was talking about. Over the years it doesn’t seem so weird any more. 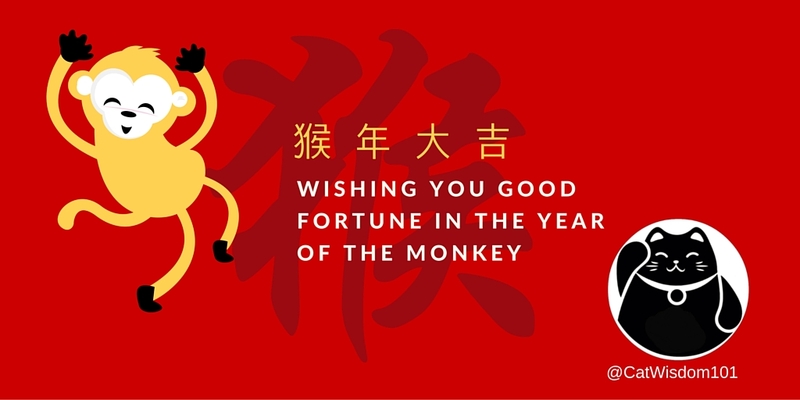 Over the past couple years, I noticed a big jump in public awareness about both feng shui and the Lunar New Year. When HGTV airs how to feng shui your bedroom, it’s gone mainstream. Ditto NBC airing feng shui experts predictions for the New Year. There are websites to quickly help newbies understand how to find the best direction calculators for sleeping, the lucky direction for your desk, auspicious times for planning anything and everything. And that advice applies to our cats. 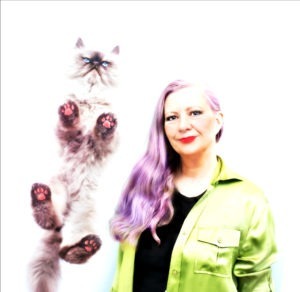 This is our post on feng shui and litter box placement. I wish I’d had all the tools and tips when I started! The Feng Shui For Dummies is a great primer. it’s all about living in harmony, honoring our planet and creating a safe, healthy and comfortable haven called home. Whatever you celebrate and or root for today and in the months ahead, I wish you all the best for the New Year! Happy Chinese New Year to you, dear friends! We’ll need to look into that litter box feng shui! I didn’t know ’bout the mandarin fruit being lucky for the new year. I just thought the peeps found ’em tasty. MO– — USES! Woo hoo Happy New Year! Happy Chinese New Year! We’re watching the Kitten Bowl. What fun! Feng litter boxes? Who knew? I know about flinging litter though! 🙂 it’ll help with litter flingers. Happy Happy Chinese New Year!!!!!!!!!!!!!!!!!!!!!!!!!! Happy NEW year to you do and hope your team wins! The Kitten Bowl is so fun, enjoy! We have started investigating Feng Shui. We think that we need to be open to others and their beliefs. When it comes down to it most of these teach the same thing, Love, Peace, Harmony,Compassion, Kindness and Balance to be shared with all things living or not. We have no use for football but adore the Kitten and Puppy Bowls. We are so glad that all were adopted!!! Thank-you and enjoy the day. Wishing you much good luck this year! I tutor English for Chinese students in China via an app. Yesterday, some college students showed me their neighborhoods from their iPhone. Yesterday, most of my students were all kids, whose parents gave them the tutoring app so they could prepare for Chinese New Year. Since China is 13 hours ahead of New York/Boston time, I can only tutor in my early morning/evening, which is their late evening/morning. A few days, I had typed something into Google translate for my landlord from Hong Kong, who speaks very little English — about the water… Google translated ‘water’ into feng shui — flow. He had turned off the water at night one day, and I said we needed water 24 hours. I will pay attention to cat feng shui. Thank you for a marvelous post. I thought that was really beautiful. Today, I will watch the kitten bowl. If John is going somewhere else to watch the SB. Maybe he isn’t, though, since Bill and Tom aren’t in it. I am so happy for the feng shui of the kitten bowl that they were all adopted. That’s cool about seeing your students in China. Ha, about translation. Enjoy and purrs to all. So glad to hear about your mom being monkey since it should be a much better year for her. I can remember my Mom talking to me about and being fascinated with feng shui about 20 years ago or so. She passed away in 2001 but I still have her hand written notes about how I should have my living room and bedroom arranged!! Wow, she was ahead of the curve! I didn’t know there was litter box feng shui! My human should look into that – including for when we travel together.